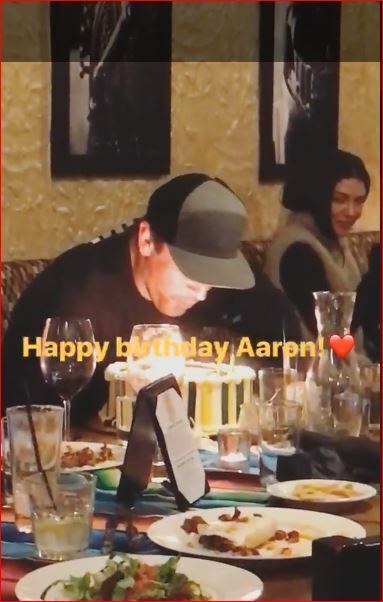 It appears Aaron Rodgers ex-girlfriend Jessica Szohr was on hand to celebrate the quarterback's 34th birthday after some pictures obtained by Terez Owens went viral. Rodgers' old flame was a part of a group on hand to watch Rodgers blow out the candles two weeks before he plans to return to game action for the first time since sustaining a broken collarbone in Week 6. Rodgers and Szohr, a star of The CW's "Gossip Girl," briefly dated in 2011 and again in 2014 when they spent New Year's together and hung out with Szohr's good friend, music icon, Taylor Swift. So, there's clearly some intimacy between the two. Szohr was the only ex-girlfriend of Rodgers to attend the party, with his more famous ex, Olivia Munn, nowhere in sight. After splitting up in April and Rodgers releasing a tell-all ESPN article by Mina Kimes , the couple's split from a three-year relationship hasn't been pretty. "When you are living out a relationship in the public eye, it's definitely ... it's difficult," he said in August of 2017. Recently, Rodgers has been linked to 22-year-old Harvard soccer star, Marie Margolius. The pair was spotted at the Martignetti brothers' Upper celebrity haunt the East Pole on Sunday Aug. 13. "They arrived at around 10 p.m. and seemed to be on a date. He wore a baseball cap and asked for the quietest, most out-of-the-way table possible. His hat was tilted down. It definitely seemed like he wanted to be incognito,” an insider told Carlos Greer from pagesix.com. Another name linked to Rodgers from earlier this year was Baywatch actress, Kelly Rohrbach, who was spotted golfing with the Green Bay QB. However, People Magazine said those reports were overblown and the couple is just friends. “[Rodgers] was like, ‘I guess every time I look at a girl, people are going to say we’re getting married.’ But no, it doesn't bother him,” the People source said.